Victory belonged to the Social Justice Coalition after a protest. By Barbara Maregele for GROUNDUP. Western Cape High Court Judge Thandazwa Ndita on Wednesday declared a section of the Regulation of Gatherings Act unconstitutional. Ndita also set aside the convictions of 10 Social Justice Coalition (SJC) members charged with contravening the Act. The case was brought by the SJC against the Minister of Police. Equal Education, the Open Society Justice Initiative and The UN Special Rapporteur were admitted as friends of the court (amici curiae). 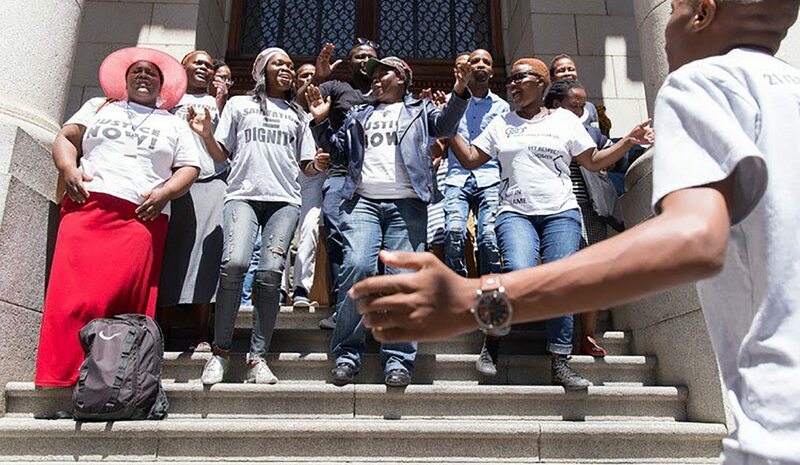 This follows the arrest of 21 members and supporters of the SJC who were charged with contravening the Regulation of Gatherings Act (RGA) in September 2013 after a peaceful protest outside the Civic Centre in Cape Town. They had chained themselves to the railing of the building in an attempt to get the attention of Mayor Patricia de Lille. According to the Act, organisers of gatherings with more than 15 people are required to submit a notice to protest to the city authorities. The SJC members did not do this. In February 2015, 10 members of the group identified as the conveners of the protest were convicted under the act. The remaining 11 were acquitted. The SJC appealed against these convictions at the Western Cape High Court in 2016. One of the convicted SJC members, Nolulama Jara, died in August 2015 but Jara’s name is still listed in the appeal. The judgment handed down by Judge Ndita on Wednesday comes six months after the parties presented their closing arguments in court. The Social Justice Coalition argued that sections of the Regulation of Gatherings Act are unconstitutional. The police argued that notice of intention to protest was necessary to allow for authorities to plan ahead and ensure that gatherings are managed in an orderly manner with minimal disruption. Before reading her verdict, Ndita apologised to the court for the amount of time she had taken to “hand down judgment without any reservations”. Handing down her judgment, she said that the criminal sanction in the act was “disproportionate to the offence”. Instead, Ndita suggested that civil liability be imposed on those who failed to give notice. “It was also suggested that the state could impose administrative penalties” – because these are fines and do not “carry with them the stigma” of a criminal conviction. “Section 12 (1) (A) of the RGA is hereby declared unconstitutional,” Ndita said. She said this would not affect criminal trials which had been finalised but would apply to criminal matters which had not been finalised or where the time for an appeal had not expired.